Time rolls along in eternal cycles of rise and decline. Utsarpini is a "rising" era in which human morale and natural conditions improve over time. At the end of Utsarpini, begins Avasarpini, a "declining" era of the same length, in which humanfi morale and virtues deteriorate. During the middle of every rising and declining era twenty-four souls become Tirthankaras. They are the humans like us who rise to that level. While accumulating different karmas, they also accumulate get a special karma called Tirthankar Nam Karma in the last 3rd of their life by performing one or more of the 20 special austerities. Tirthankar Nam Karma matures in the final life and leads the person to become a Tirthankara. 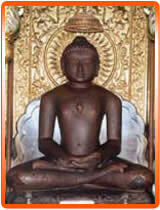 After attaining omniscience, Tirthankara reorganize Jain religion to suit the changing times. Tirthankaras are also called Arihantas, Jinas, Kevalis, and Vitragi. Arihant means "destroyer of inner enemies," Jina means "victor of inner enemies," and vitragi means "one who does not have anymore attachment or hatred towards anyone." This means that they are totally detached from worldly aspects. They have destroyed the four ghati karmas, namely Jnanavarniya Karma, Darshanavarniya Karma, Mohniya Karma, and Antaraya Karma. They are Kevaljnani meaning that they know everything everywhere that happened in the past, that is happening now, and that will happen in the future at the same time. They are also Kevaldarshani, meaning that they can see all that happened in the past, that is happening now, and that will happen in the future all at the same time. 24tirthankaras.com is designed and maintained by Rising.